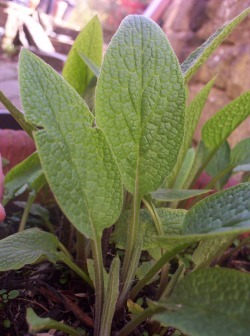 Symphytum officinale - Natural Health - Lancaster and Preston . Symphytum officinale is commonly known as comfrey and is a member of the Boraginaceae family. The leaf is used both internally and externally, and the root nowadays is only used externally. Another name for comfrey is knitbone - traditionally it was used to aid the mending of broken bones. Both the Latin and the common names relate to comfrey's ability to heal bones: Symphytum is derived from the Greek for 'to unite' and comfrey is derived from con firma meaning the bone is 'made firm'. Comfrey is a demulcent, expectorant, soothing astringent, vulnerary, accelerates mitosis, and is anti-haemorrhagic. A medical herbalist may use comfrey as part of a prescription for a number of conditions: its demulcent action makes it beneficial for gastritis and colitis and as an expectorant and demulcent it may be used alongside other herbs for respiratory problems. 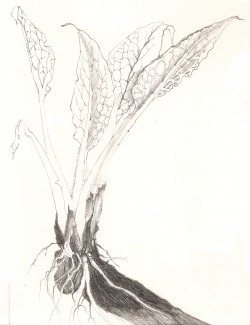 Externally comfrey can be used to promote wound healing and fractures. 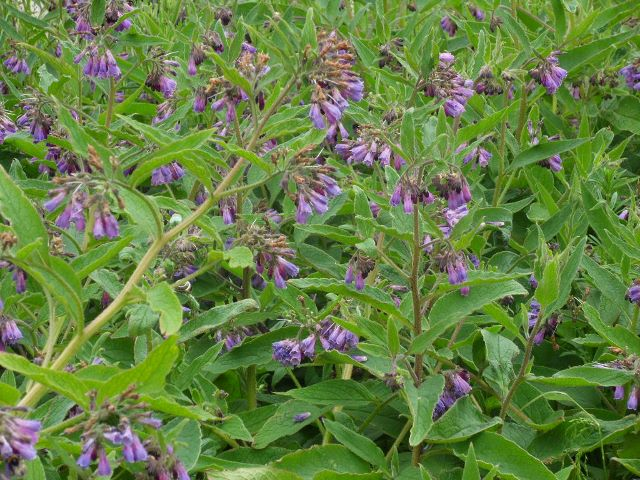 From personal experience comfrey is beneficial in the treatment of bruises and minor burns - as a child my mother would apply comfrey root ointment to myself and my brothers whenever we bruised ourselves. 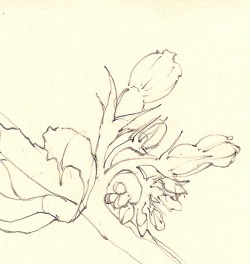 It was invaluable and seeing the successful application of comfrey on a number of occasions led to a deep belief in the healing power of plants. Comfrey is one of my favourite plants and never fails to impress me! 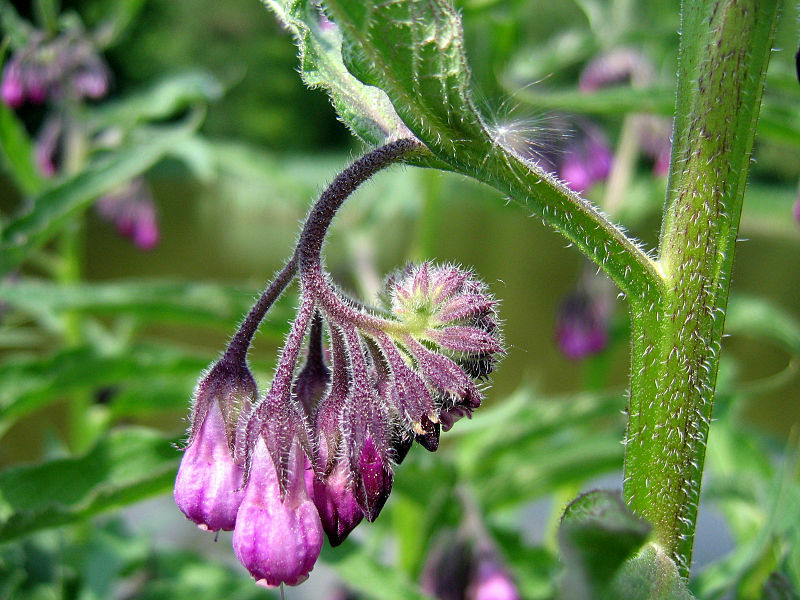 Comfrey contains allantonin which stimulates tissue repair by enhancing cell proliferation. However, external application of comfrey on deep wounds may lead to tissue forming over the wound before it has healed deeper down trapping infection; abscesses may then form, hence it is important to only use on clean wounds. A consultation with a medical herbalist is needed before using internally. 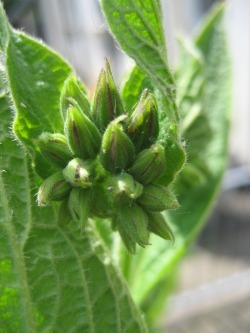 Dioscorides prescribed Comfrey tea to treat respiratory and gastrointestinal problems. According to Culpeper 'This is a herb of Saturn and I suppose under the sign of Capricorn, cold, dry and earthy in quality'. Comfrey oil or ointment can be applied to sprains. Can be used for composting and mulching. A liquid fertilizer can be made by cramming leaves into a barrel of water. Place at the bottom of the garden as it is a bit smelly!